While shrimp boil is common on the Gulf coast, you can also make it at home wherever you are in the world. 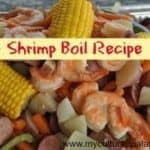 Here’s a great shrimp boil recipe to feed 25, 100 and even 200 people along with tips and tricks to help. Because we wanted to celebrate our house in Alabama selling and becoming Texans for good, we had a shrimp boil. So I got to researching and trying to come up with a good go-to recipe for our family. When we moved from Alabama to West Texas, we put our house on the market – just in time for the housing market crash. As a result, it took over 5 years for our Alabama home to sell. And it finally did! So it was definitely time to party! What better way to celebrate than with a shrimp boil? Shrimp boils are very common on the Gulf coast, but for some reason, there are just not that many of them in West Texas! But our location and lack of coastline didn’t stop us. Because it takes a good amount of time to cook, a shrimp boil is all about sharing. That means that is great for a large gathering in someone’s backyard. The more the merrier! But make sure you have your biggest cooking pots ready to go. Our oldest daughter and her husband were on vacation to the Texas coast and brought back a lot of frozen shrimp. As a result, they have had quite a few shrimp boils. The following recipe is from them. Her husband had worked out the proportions of the ingredients. I didn’t even have to worry about researching to create the perfect recipe! All I had to do was tell him how many people I wanted to feed and viola – he provided the recipe! 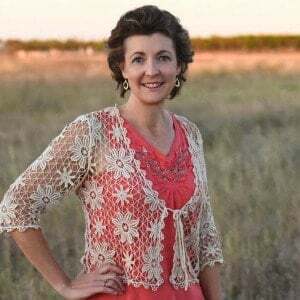 Feeding An Army – The Easy Way! First, I need to explain how this shrimp boil recipe is different than most I’ve featured on this blog. Not only is a shrimp boil delicious, it’s deceptively easy to make. Whether you are serving a large crowd or a small gathering, this meal lends itself to minimal work the day of your event. Most of the work is done beforehand by cutting and chopping the meat and vegetables. You can definitely delegate that work to a trusted child or teenager if you need extra help getting everything done. After the shrimp boil is cooked, drain the water and empty the contents of the pot onto a table with a plastic tablecloth. Maybe to keep things a bit more civilized, you can place contents into serving containers. I wanted our shrimp boil to be easy and civilized, so I used large disposable aluminum containers. Then, you can get creative with your sides since this recipe is so versatile. You can serve the shrimp boil alone or add coleslaw, rice, rolls … and it all works! A Shrimp Boil By Any Other Name… Is Still As Tasty! Let me just say that this is one way to make a shrimp boil. I really was amazed at all the different varieties there were of this dish. For example, in some places it’s called Frogmore Stew?? There are two kinds of social gatherings in coastal Georgia and South Carolina that revolve around shellfish. 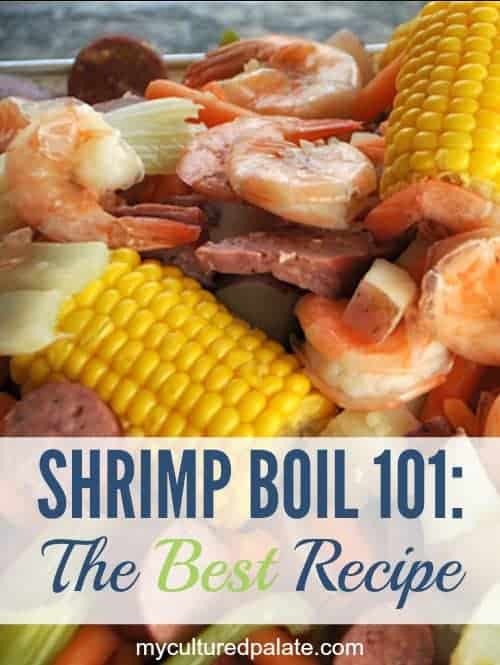 One is very much like a Louisiana boil, usually involving shrimp, corn on the cob, sausage, and red potatoes, and sometimes ham, and is considered part of Lowcountry cuisine. Known variously as Frogmore Stew, Beaufort Stew, a Beaufort boil, a Lowcountry boil, or a tidewater boil, they tend to be a bit milder than their Louisiana cousins. For example, it is not unusual for a Lowcountry recipe to call for a mixture of hot and mild boil seasonings, whereas a Louisiana recipe may start with crab boil packets and add large amounts of cayenne pepper. While shrimp are most often used, crabs or crawfish may be included if available. This is also a bit different from a Louisiana boil, which usually involves just one kind of shellfish at a time. Frogmore is name of a community in the middle of St. Helena Island, near Beaufort, South Carolina. Although there are many versions of this dish around, the name Frogmore Stew was coined in the 1960s by Richard Gay, one of the owners of Gay Fish Company, circa 1948, on St. Helena Island. Frogmore Stew became far more well-known after it was featured on the cover of Gourmet Magazine in the 1980s, and is enjoyed by all, with this name, to this day. In 2005, The Travel Channel featured Richard’s brother, Charles Gay, cooking Frogmore Stew in its popular program Taste of America with Mark DeCarlo. I had no idea this recipe has such an interesting history! My favorite thing about this dish is that it enables families to come together and enjoy each others’ company. It’s one of those meals that encourages people to talk, linger, and socialize. And since we make a LOT of shrimp boil at once, no one rushes conversations due to being worried about the food running out! First, be sure to purchase shrimp that is in the shell and de-veined. Why? When you are boiling the shrimp in a pot of water, it will dry out and not taste as good if you use pre-shelled ones. Second, if you are cooking in large quantities, make sure you plan ahead with your supplies and time. We used 10-gallon stockpots over propane burners. Obviously, that is a lot more water than people normally boil, so be sure to allow plenty of time. It took us about 30 minutes to get the water to boil. That’s it! While we had a bunch of fun making and eating our shrimp boil, the sweetest part was celebrating and enjoying the company of our friends and family. If you’ve tried this Shrimp Boil Recipe or any other recipe on Cultured Palate please take a minute to rate the recipe and leave a comment letting me know how you liked it. I love hearing from you! You can also FOLLOW ME on PINTEREST, FACEBOOK, INSTAGRAM, YouTube and TWITTER. Southern cooking that feeds an army! We cook in batches using the amounts for 25 people. Total cooking time is 60 minutes after the water boils and you begin adding the ingredients. Place seasoning bags in a mesh bag or cheesecloth. Add potatoes and seasoning bags. Add carrots, corn, and sausage. Add bell peppers, celery, jalapenos and habaneros. Let cook 5 - 10 minutes. Wait for 5 - 8 minutes. The shrimp should be pink and tender. Drain the water and dump the shrimp boil onto a table with a plastic tablecloth or place in serving dish - allow everyone to help themselves! I use a 10 gallon pot to cook the shrimp boil recipe in and it holds the ingredients for 25 people if you only add about 2 gallons of water. Second, if you are cooking in large quantities we use 10-gallon stockpots over propane burners. Obviously, that is a lot more water than people normally boil, so be sure to allow plenty of time. It took us about 30 minutes to get the water to boil. For What Occasion Do You Have a Shrimp Boil? If you were to charge a person by the foil pouch, 1) how much of each item would go into the foil pouch for 1 serving and 2) how much would you charge per foil pouch? S, That is hard to say. I would probably do it by the bowl since if you serve 1 piece of corn that would take up a lot of space in your pouch. As far as the pricing, you would just have to figure the cost of all ingredients to see how much the recipe costs and what to charge to make your profit. did you split the seasoning and re-season after each batch or put all of the seasoning in at the beginning? Jefferson, we re-seasoned each batch but did not dump out the previous water – just add more seasoning as you do other ingredients. Wow, sounds like a great celebration. I bet this was so delicious! Thank you for posting this. Going to do my first ever boil for around 70 people in a couple of weeks. Going with your proportions! Really appreciate the info! Jeremy, so glad and enjoy! What size Zatarain’s boil package? I’m seeing 3oz, 4oz & 16oz packages. Jeff, I didn’t realize there were different sizes! Our local store only carries the 3 oz size so that is what I use. Jennifer, I am so glad it helped! And, yes, you can use Old Bay without any problems. I hope everyone enjoys it and I look forward to hearing about your party. Our son is getting married Sept 15, 2018 and he requested a shrimp boil for his rehearsal dinner since we are from SE Texas. I am planning on feeding 35-40 people , but am also serving Gumbo, French bread, and deserts. Should I prepare recipe for the 25 only or the recipe for 25 and half the recipe for the extra 10 people? Melissa, with the sides, I would probably fix for 25 people. But, if you don’t mind having leftovers, then doing the half recipe would also be fine. I hope it goes well and congratulations! I love this post. I love making my boils in an insta pot, however this only holds 8 quarts, so I would need to do a few batches to feed 25 people. Do you have thoughts on making boils in batches? How to keep things warm? Chafing dish? Thoughts? OR should I buy a huge pot and cook on my stove? Sarah, I would get a large pot just for the ease of it but if you do it in batches, I would keep it warm in chafing dishes. I hope this helps. Hi! I’m a little confused about your proportions, as the “100” recipe seems to only be double the “25” recipe. Could you provide a little clarification? Karen, you are right – thank you so much for bringing this to my attention! I recently did an update for how recipes are displayed and these values were messed up. I have updated the post to be correct. Thanks again!